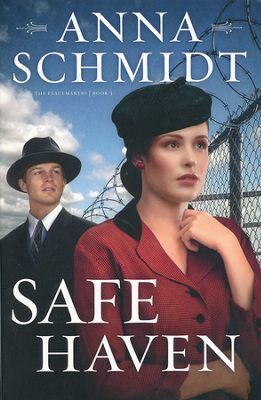 Safe Haven, the third book in the Peacemakers Series, was an enjoyable story from cover to cover. It depicts the tale of the refugees coming from Europe to New York’s Fort Ontario Emergency Refugee Center at the end of World War II. Suzanne Randolph has done her best to make a career in writing but a misjudgment in character has created a major hindrance in the advancement of her career. With a chance to tell the story of the refugees in Fort Ontario, Suzanne travels to New York and finds not only a powerful story, but an unexpected possibility at true love. Theo Bridgewater has been raised in the Quaker faith, and peace is what he aims for. When he is told he has family arriving at Fort Ontario from Europe, he travels there to welcome them. He meets Suzanne at the boardinghouse and is taken by her strength and ambition, as well as her compassion. Ilse and her family have seen horrors in Germany and the reprieve to America is what they need to recuperate. Although the accommodations are not fancy, they are so much better than what Ilse’s family has endured. In a quote from the book, Ilse’s thoughts are captured as the family waits with their baggage to be registered for Fort Ontario. She is looking at the tag that they are required to wear which says “U.S. Army Casual Baggage imprinted on it as if they were no different from the cardboard suitcases and paper bags that held their belongings” Isle thinks, “when one is an outcast, she thought, one has no other identity” (pg. 34). I especially enjoyed a portion in the story where Americans see the fort as being less than hospitable for the people living there. The refugees are given hand me downs from charitable organizations as many have arrived with little or nothing including shoes and coats. In the fort, Ilse notes that there is fresh milk at every meal and real bread; simple delights that she has not been afforded in such a long time. I loved the contrast between the two views because it showed such a powerful representation of one group giving their leftovers and the group of recipients being so grateful for those same leftovers. Ms. Schmidt does an excellent job of describing the not-so-welcoming attitudes of the Americans as well. There were far too many who held Anti-Semitism and ignorant prejudices in their beliefs and were unkind to the refugees. Little Liesl explains to Suzanne about the kids at school teasing her and being mean to her because of German decent. Liesl tells her, “Theo told me that sometimes you just have to explain things so people’s questions get answered and then they’ll be fine” (pg. 131). Safe Haven does a fantastic job of teaching historical facts while incorporating a beautiful story of friendship, love, healing and new beginnings. This book is one I absolutely recommend.